I first posted this delicious recipe a year ago. It has definitely gone into the rotation as a healthy staple in our house. We just returned from vacation in Spain and Portugal and we did do our fair share of eating. We biked for one week so that week sort of gets a pass on the high calories we took in. Lots of bread, lots of dessert, and lots of food in general. Now that we’re home I just want to eat a little cleaner and a little healthier till we get back into the swing of things and our jet lag is gone. There is no excuse not to make cauliflower rice now that it’s available in pre-prepared cauliflower rice packages. Both Green Giant chopped cauliflower in a bag as well as at Trader Joe’s and almost every supermarket in America has it on it’s shelves. The pre-chopped bags come in 16 ounce size bags which is what I used for this recipe. You can buy extra bags and keep them frozen! It’s wildly popular so grab it while you can and get a few extra bags while you’re at it. Of course you can always chop your own if you don’t have access to any of these products or you just feel like making more work for yourself. This is so delicious and I add chicken or shrimp or even tofu , any protein you like works well here. Other veggies are great here too like broccoli , kale, whole small pieces of cauliflower etc. There are so very many variations on this theme, feel free to go wild with it. It’s a low carb alternative to regular rice and a delicious healthy way to do so. 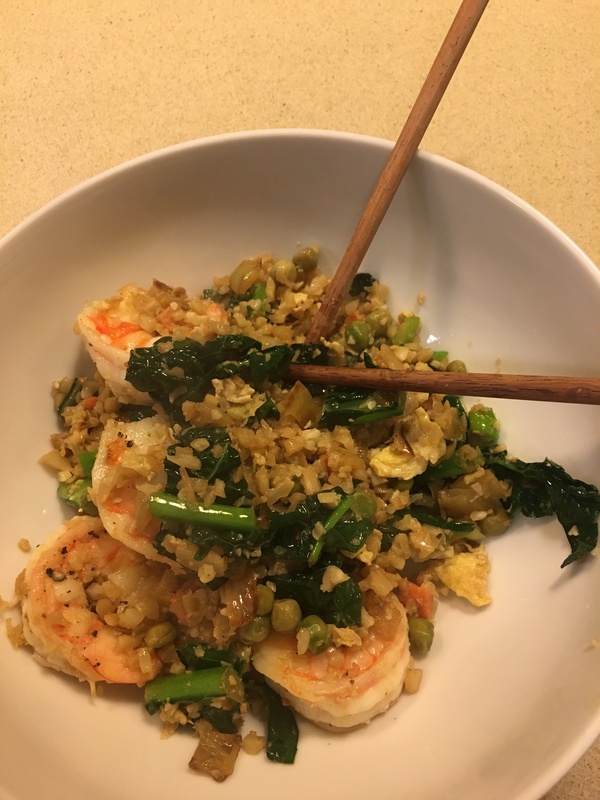 Photos of rice bowl with shrimp and kale are here as well. 1 bag chopped cauliflower rice ( I found Green Giant brand and used it) I used a 16 oz. bag you can use up to 24 oz. Or 1 medium head of cauliflower. 2 Tablespoons vegetable oil, plus a little bit for eggs as well. You can cut the oil down on eggs if you’d like. I felt like I needed the 2 tbsp. of oil for onions , etc. You can start 1 tbsp. and add as you need. 1 cup frozen peas and carrots –I had it in the house and how easy was this? you can use broccoli or corn or all. 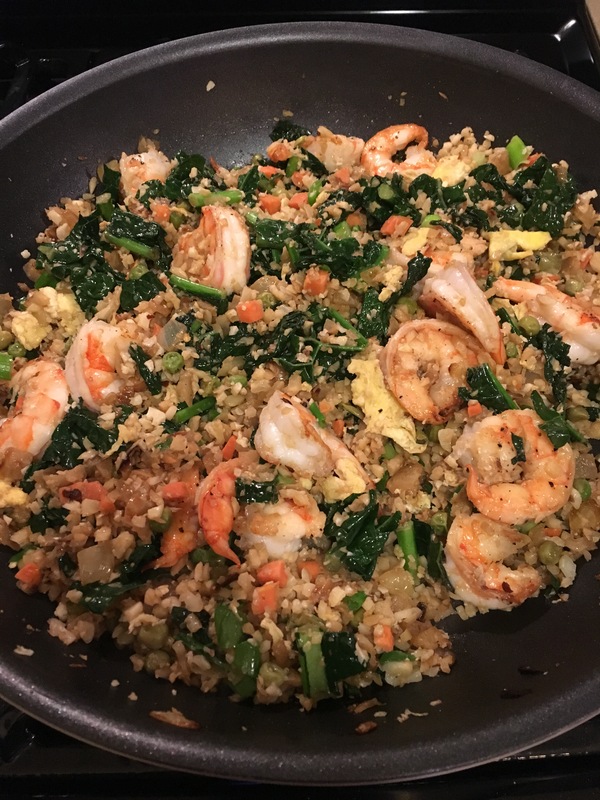 *kale — after onions were sautéed I threw torn up kale pieces to pan right before cauliflower rice and other ingredients. Kale broke down rather quickly and was an extra added delicious flavor to this bowl. *chicken, shrimp whatever protein you like . I used a thin chicken cutlet as it was just for me, if I were making for more people I would probably add about 1/2 lb. of cutlets diced up. *salt and pepper to taste — you may want to add a little but don’t add till the end and you’ve tasted it. I added a little sprinkling of salt and pepper. If you must make the cauliflower rice, take out the processor, pulse cauliflower in the large bowl of a food processor until it resembles rice, about 3 minutes, set aside. If you bought the bag–you’re ready. Heat about 1/2 Tbsp. of vegetable oil in a medium skillet over low heat , add beaten eggs and cook until cooked through. I didn’t scramble , I made a large pancake. About 2-3 minutes per side, flipping once. Let cool completely before dicing into small pieces, set aside to cool. Heat 1- 2 Tablespoons Vegetable Oil in a large skillet or wok over medium high heat. Add garlic and onion to the skillet and cook, stirring often, until onions become translucent, at least 5 minutes. I like my onions translucent for this recipe. Lower the heat and stir in peas and carrots (and any other veggies you’d like) and cook until vegetables are tender, about 5 minutes. I cut up a thin chicken cutlet into small pieces and added it with the vegetables. I ended up using the 2 Tablespoons of oil, do what works best for you. Stir in the cauliflower, diced up eggs, green onions and soy sauce mixture. Cook, stirring constantly, until heated through and the cauliflower is tender, about 5 minutes . Taste for soy sauce and add if necessary. I didn’t add any salt because the soy sauce was salty enough. This is a very loose recipe so please feel free to experiment. 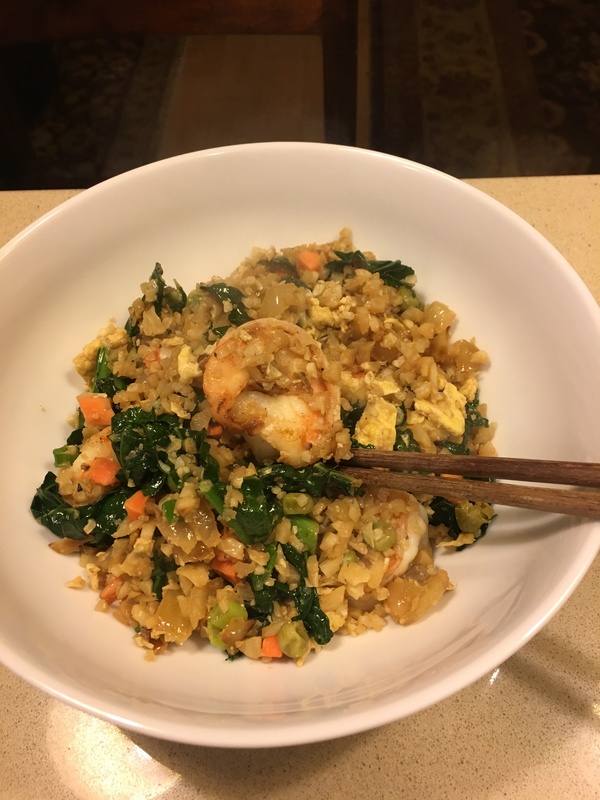 This entry was posted in cauliflower, Stir Fry, vegetables and tagged cauliflower fried rice. Bookmark the permalink.